Coach booked for the Norfolk and Norwich Festival – return trips provided from Sheringham and North Walsham. Get in touch with us or come along to one of our regular sessions for more details/to book! Also, fab news, we’ve just had confirmation of a £2,000 grant from Tescos Bags of Help, which is going to help keep our Friday group running throughout 2019! Thanks again Tescos! See our regular events page for details of our percussion-making and music-making workshop as part of Sheringham carnival week (Monday 5th August 2019 2-4:30pm)! Due to lack of numbers and problems with venues, we’re temporarily cancelling our Fakenham Skylarks singing group. We shall re-assess, re-group and re-launch later (subject to demand!). We shall keep you posted! Thanks to everyone that has been involved and supported this group previously. So much going on, I thought it a nice idea to produce a newsletter to help everyone see what’s going on! I’ll distribute through participants of our regular groups etc and here’s an electronic copy (PDF). Please do share! I’ll try to produce these quarterly (so next one will be in May 2019). We’ve delighted to have joined the British Voice Association (BVA)! This will help our team’s professional development and help us ensure we can continue to improve the quality of our sessions and the best possible information, expertise and knowledge to our participants. You can view and download some leaflets provided by the BVA on our Research and Resources page, including one that shows how singing is good for you! We are delighted to have appointed Elsie-May Robson as a Trainee Session-leader! 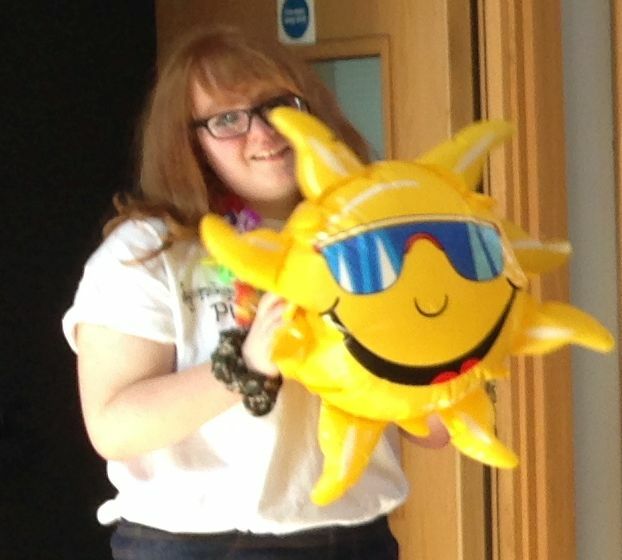 Thanks to the StartEast Grants Scheme and funding from the European Regional Development Fund and the Arts Council England Creative Local Growth Fund, we have been able to recruit Elsie-May onto the team. Else-May will be helping us develop our regular workshops across the district and they will provide more capacity generally to expand the work we’re doing. Elsie-Mae, Tina and a regular volunteer, Amanda, are also training with Excel 2000 so that we can lead more physical exercises linked to songs within our sessions. Playing for Cake is paying for this training from it’s own funds raised this year. Massive thanks to the North Walsham Community Shop for awarding funds to help deliver sessions at the Cameo Dementia Cafe in North Walsham and keep the North Walsham Skylarks group going! Helping keep the North Walsham Skylarks group will, amongst other things, help people with Parkinson’s retain their voice. Fab news all round! We are currently recruiting! We have posts available for two musicians to train with us as session-leaders. The posts would be on a self-employed basis for six months and involve learning all aspects of setting up and running community singing/music-making for health workshops. If you’re interested please get in touch to discuss or send a copy of your CV with a covering letter stating why you’re interested in doing this work by 31st August 2018. See this great, interesting video on YouTube about Sing to Beat Parkinson’s, training and the research that’s been conducted. Well done Grenville and the team! You may spot Tina, Louise and Liz in the film, taking part in the training and Snape Maltings and those of you that come to sessions will see where we’ve drawn some of our songs and activities from! I really enjoyed being with the ladies of Ingoldisthorpe WI On Saturday for their ‘Healthy Living’ day. What a lovely bunch of people and a really well organised, fun, informative and beneficial day! Well done to the organisers. The first session on ‘Laughter Yoga’, led by Jean Clarke, was great and the exercises used were a fabulous warm-up for the singing session which I led afterwards. Now to get ready for today’s session at the Sheringham dementia support and activity group! Thanks to Norfolk Community Foundation, the first wave of funding is secure for Mid-Week Music at The Hub – so we’re back on 19th September 2018 at Sheringham Little Theatre! Keep an eye on our Events page for more details. Also, you can now download a copy of ‘Sheringham by the Sea’ – a song written by participants of our workshops during the last series – see our Shop for a link to download a copy and make a donation. Excel 2000 who have been shortlisted for the People’s Projects 2018 Finals for their project Life Balance which will provide engaging health and wellbeing activities whilst giving people the opportunity to socialise and form new friendships. Please find the details below regarding their proposal. Could you please share this information and spare a moment to vote? Nice local press release now online re our Singing for Lung Health classes and new Skylarks (Sing to Beat Parkinson’s classes) across North Norfolk. The article will be in the local papers this week. Thank you Karen Bethel, from the North Norfolk News, for organising the press release! Our ‘Skylarks’ are taking flight! Please see our Sing to Beat Parkinson’s page for details of this new service we’re bringing to North Norfolk. We know the value of speech therapy to people living with Parkinson’s and the value of being able to retain the voice and voice quality for as long as possible. Our Skylarks singing groups are designed to offer ‘singing therapy’ that supports the work of speech and language therapists in a fun and sociable way. We are delighted to welcome Louise Lim, a Norwich-based speech and language therapist, to our team (her details will be added to our ‘about the team page soon!). Her contribution to this project is extremely valuable and we know that participants will enjoy (and benefit from) her expertise over the coming months. Hope to meet you at one of our sessions soon! 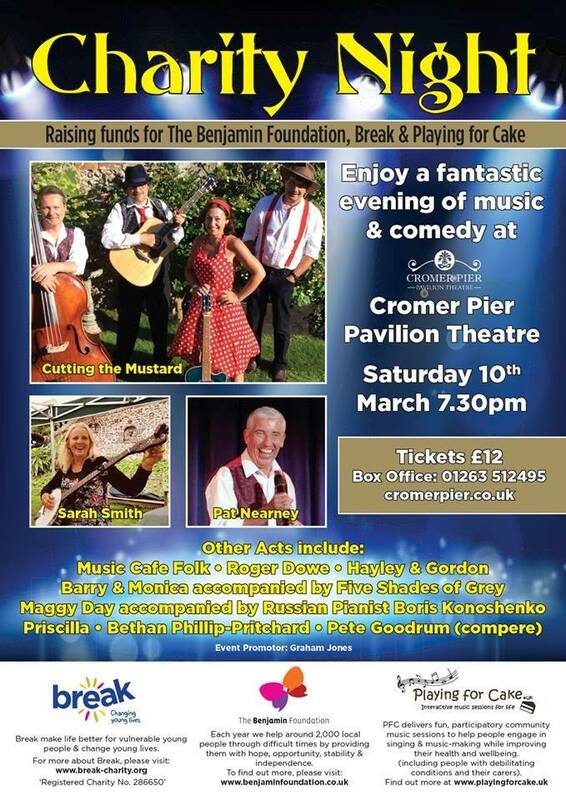 On Saturday 10th March, Cutting the Mustard (Tina, Brian, Ervin and George) are taking part in a charity night on Cromer Pier and 10% of the funds raised from seat sales will be donated to Playing for Cake! Please come along! You can buy your tickets from the Cromer Pier box office. Lovely news article about the Swaffham Stroke Association Music Group . I met Shirley (one of the attendees featured in this press release) last week and she actually got up and played the keyboard for us! Absolutely wonderful to see Shirley enjoying music again and fantastic that she’s now inspired to play the piano again. The new schedule is out! Check out the new programme of ‘Mid-Week Music at the Hub’ sessions from January to March 2018 on our Events page. These sessions are designed to be enjoyable for all ages and abilities. Get in touch if you’ve any queries or would like more info. Fabulous that we’ve now formalised our affiliation to the national Sing to Beat Parkinson’s programme set up by the Canterbury Cantata Trust. It was also fabulous to be with the Cromer Parkinson’s Support Group this morning. Fingers crossed we’ll have a regular session set up for them in Cromer soon! You can hear an interview by Gemma (please see below) from the Stroke Association about the new singing group for stroke survivors in Swaffham online at the BBC Radio Norfolk website – see the Matthew Gudgin show 10th October 16:00 – 19:00 (the interview was held at around 16:40pm so just forward by around 40 mins). A few regulars of our Singing for Breathing class (see our Events page!) have told me that they have started to notice a difference with their breathing as a result of coming to the classes, which is fabulous news. On top of that, our first ‘Mid-week music at the Hub’ took place (again, see our Events page!) and it was great to see such a mix of people from the local community coming together to sing together. Seeing people living with dementia and their carers coming together with others from the local community to relax and sing together was just wonderful. 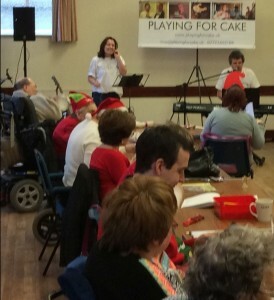 People attended that just love to sing with others as well as people who have respiratory conditions or neurological problems. It was a lovely atmosphere and the fact that people can have a go at a wide range of music-making activities (including percussion, drumming and playing a ukulele!) over the weeks fills me with glee. And seeing a 90-year old man enjoying singing a Jessie J song was precious. He remarked “Well it was different to what I’d normally sing but I thoroughly enjoyed it!”. Another great development is that I’ve been working with a wonderful lady, Gemma Smith, who is a Communication Support Coordinator for the Stroke Association and works out of the Stroke Unit at the Queen Elizabeth Hospital in Kings Lynn. Gemma has gained funding to set up a singing group with people who have suffered from strokes so I’m off there to work with her group in Swaffham for four weeks in November! You can find out more about the group and how to register here. 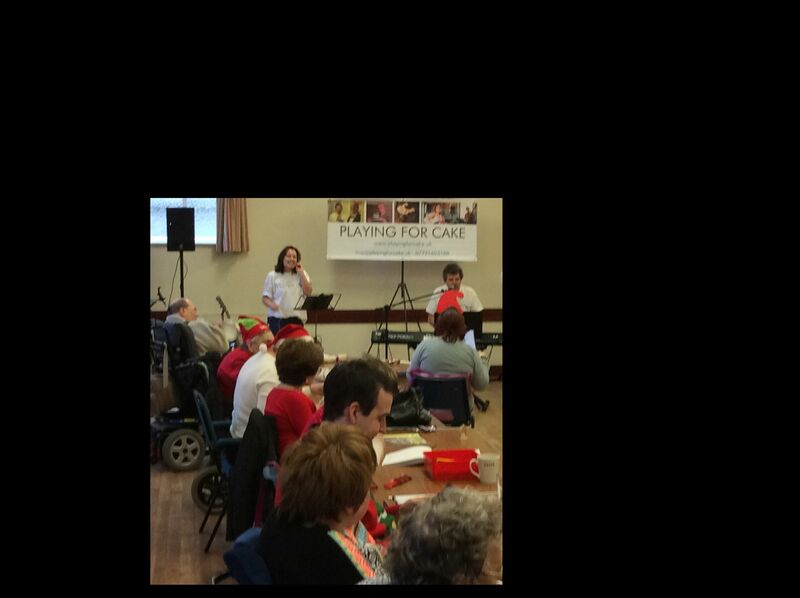 The hope is that of-course the fun, friendly singing sessions will help improve and re-build confidence with communication amongst those attending. I’m really looking forward to working with this group! If you live in or around Swaffham and know of someone who might like to come along please do get involved! I’ll keep you posted of any further developments! Lovely news article in the North Norfolk News about Playing for Cake! You can see the article online here. Check out our programme for Sheringham Little Theatre’s ‘Mid-week music at The Hub’! Info is also available on our Events page. The idea of this is to get people meeting up and just enjoying singing/making music together. People who are perhaps isolated or in ‘harder to reach’ groups are particularly welcome so if you can help encourage people to come along and give it a go that would be a great help! Hope to see you there! The timings of our new free community music-making and singing workshops are now confirmed! Every Wednesday 4-6pm in the Hub (café) at Sheringham Little Theatre from 4th October through to 28th March (excluding Christmas). Keep an eye on our Events page for more info and the programme as every week will have a different theme/activity! Everyone welcome! Also, we won the maximum award of £4,000 from Tescos Bags of Help Scheme! This money is being used to establish regular singing groups for people with lung health conditions, people living with Parkinson’s and/or dementia and their carers. Research tells us that singing can really help people living with these types of conditions in a range of ways so being able to bring these benefits to people in North Norfolk is truly wonderful news! Great news! We’ve received confirmation of funding from the National Lottery for weekly community music-making sessions from the first week in October to Easter 2018 at the Hub, Sheringham Little Theatre! We’re planning a variety of styles and themes for the 24 sessions we’ll be running, with guest musicians leading the workshops. The sessions will include using the voice and other instruments and will be suitable for complete beginners as well as people more experienced with singing or music-making. Themes will include a drumming workshop (or two!) and some community song-writing ‘on the fly’! We’ll keep you posted for details of days and times etc here and on our Events page. Funding towards the drumming workshop has also come from Norfolk County Council and Sheringham Town Council has also contributed towards the costs of running this project. We have lots happening! We’ve just put in a bid for funds for a joint project with Sheringham Little Theatre. We hope to run weekly community music-making and singing workshops in the Hub (Sheringham Little Theatre’s café) from the end of September this year to Easter 2018. The sessions will be open to anyone in the community and carers and the cared-for will be particularly welcome. More about this later! If you suffer from breathing difficulties, which includes tightness of the chest as a result of stress/tension, come along to our fun class that combines singing with learning about better breath management. Fridays 3-4pm at Sheringham Community Centre, Holway Rd, Sheringham NR26 8NP. Do you live with dementia or care for someone with dementia? Come along to the Sheringham dementia support group meeting and ‘dementia cafe’ on Monday 17th July 11am – 12:30pm. We’re delivering a fun music session and you’ll be made very welcome! This is at St Josephs Church Hall along on the Cromer Road (next to the Doctor’s surgery) in Sheringham. Also, next Monday (5th June) and Monday 19th June there are free singing workshops run by Sing Your Heart Out (SYHO) in Sheringham. These will be held 2:00-3:30pm at The Lighthouse on the Cromer Road in Sheringham. You don’t need to have sung before or read music – this is just a chance to relax, have fun and lift your spirits (if you need them lifted!) in a very supportive atmosphere. Nice people and a nice cuppa too. Hope to see you there! On 8th August, we’ll be at the Fakenham Parkinson’s support group and we’ll be at the Cromer Parkinson’s support group meeting on 8th November. Get in touch if you’re interested in coming along or want to find out more. 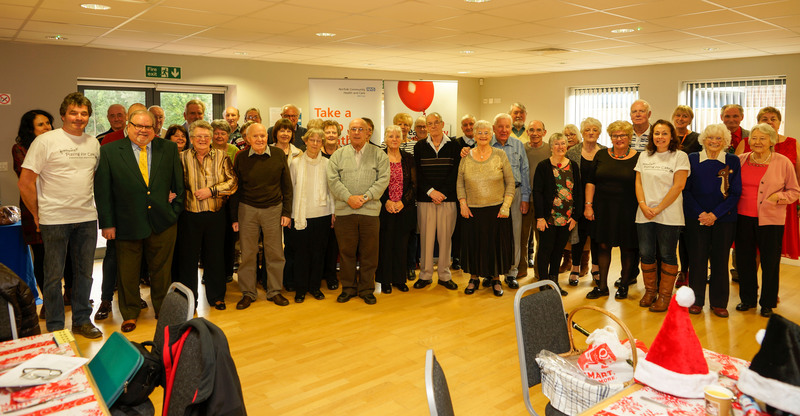 We hope to get a more regular singing group established for people living with Parkinson’s and their carers following these ‘taster’ sessions so that people locally can start to gain the benefits experienced by others across the UK. See our ‘research’ page for more information about this. I will be back with more updates soon! For now, enjoy your summer and hope to meet you at one of our sessions soon. Fabulous news!! We’ve just heard our ‘Sing Out for Health’ project has been accepted by the Tesco Bags of Help scheme! This means we’ll have a voting box in the Sheringham store May/June this year. The minimum we’ll receive is £1,000 but if people vote for us we’ll receive the maximum award of £4,000! This will really help kick-start our Parkinson’s, dementia cafes and lung health music/singing sessions, bringing some light relief, fun and real health benefits to people living with these conditions. If you’re in the Sheringham Tesco store in the summer and you get a blue token, look out for our voting box! Thank you! What a lovely morning with the Fakenham Alzheimer’s Society Support Group! And it was great to have our ‘little ray of sunshine’, Rebecca, with us today too! Rebecca is volunteering with us to gain work experience and she aims to study Health and Social Care at A-Level, from September so that she can gain employment in the care sector. Good luck with that Rebecca! And while we’re talking of training … I’m off to the British Lung Foundation’s HQ at the weekend to start my training to deliver singing workshops specifically designed to help people living with chronic respiratory illnesses improve their lung health. So you can wish me luck too! Hope you are all keeping happy and well. Enjoy Easter and thanks for taking an interest in Playing for Cake. I’ve been on a training course organised by Prof. Grenville Hancox and Nicola Wydenbach in Folkestone. 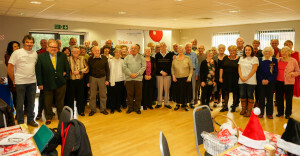 The training was to be able to lead singing workshops with people living with Parkinson’s and their carers. What an inspiration Grenville is! He has been involved in research that shows the direct benefits participants achieve from singing. The group he’s been working with is called The Skylarks and are based in Kent. You can see a video they’ve made here which explains more about the ways in which health benefits for participants are realised. Grenville has set up a scheme called Sing to Beat Parkinson’s and I’m now in touch with local support groups (run by Parkinson’s UK) to get some singing groups established in North Norfolk. Watch this space! In addition, I’ve been accepted (after a rigorous process!) on the British Lung Foundation training to lead singing groups for people with respiratory illnesses. I’m working with North Norfolk’s Breathe Easy support group to establish a singing group to help local people improve their lung health. I’m attending the training in April in London and we’re planning to start the singing group in June in Sheringham. George and I are also looking forward to delivering sessions at the Fakenham and Sheringham dementia cafes soon, which is our joint project with the Alzheimer’s Society, part-funded by the Cromer and Sheringham Crab and Lobster Festival. Finally, in relation to all the projects above, I’ve just submitted an application to Tesco Bags of Help. I’m hoping that this may lead to funds being raised to help establish the groups. Busy busy and fingers crossed! Thanks for taking an interest in Playing for Cake and keeping up-to-date with our news. Don’t hesitate to get in touch with me if you’ve any queries, suggestions or you’d like to get involved! We’re in the news! Check us out in the EDP last week! And we’re included as an ‘inspiring story’ by NWES who gave us free business start-up advice. Thank you to all involved in the article and for the recognition of our work. Get in touch if you have a specific project idea or if you can help with fundraising so that we can reach more people and achieve our aims. Happy New Year to everyone! And what a great start for PFC! We’ve just heard that we’ve been granted £250 by the Cromer and Sheringham Crab and Lobster Festival to help towards a partnership project with the Alzheimer’s Society to deliver some music sessions to members of the Sheringham dementia café! We will look forward to delivering these sessions this year, which we sincerely hope will be of benefit both to people living with dementia and their loved ones/carers. Thanks to all involved at the Cromer and Sheringham Crab and Lobster Festival! Any donations, no matter how small, will be very gratefully received. Please help us raise funds to secure at least one year’s worth of sessions. What fun with The Friday Group again today! A lovely Christmassy session with lots of singing, percussion and a pass the parcel! Great end to the week and PFC sessions this year. What a fantastic bunch of people the staff, volunteers and members of the Friday Group are. Thank you for having us! Fun with the Friday Group Christmas session! Really looking forward to working at Glendon House in Overstand on Friday 9th December – we’re certainly hoping to put a smile on some faces there with some Christmassy tunes! Also looking forward to being with The Friday Group again on Friday 16th. Things are progressing with the project with the Breathe Easy Group in Sheringham. Tina will be training with the British Lung Foundation in April 2017 to get the singing workshops started and make sure the sessions are designed to maximise the benefits members can get from participating in terms of their lung and respiratory health. It’s fabulous to be working with a highly respected senior respiratory nurse specialist in the field on this project. 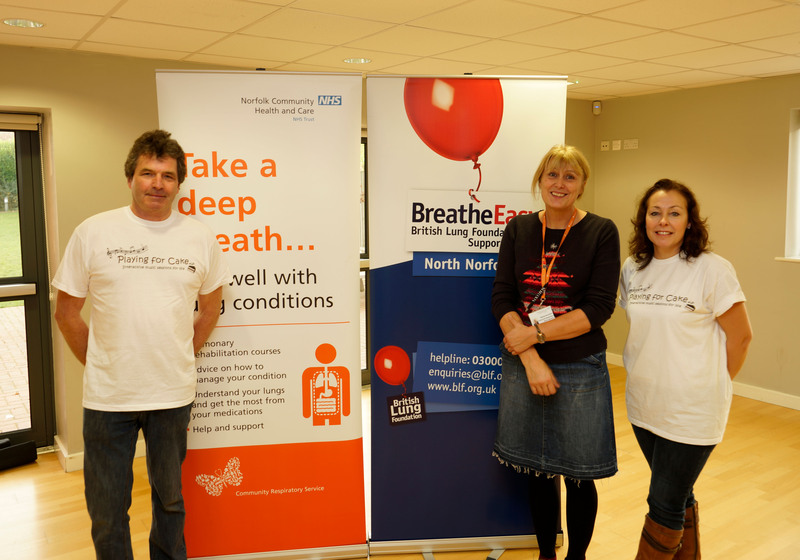 Mandy Beresford is also the Chair of the Breathe Easy Group. Here’s a picture of us with Mandy and all the lovely members of the Breathe Easy group who we’re looking forward to hearing in fine voice next year! What a lovely bunch to be working with and we’re looking to have an awful lot of fun and laughter while bringing about real benefits to the overall wellbeing of these people that have to live each day with debilitating lung or respiratory conditions. We are fundraising to be able to bring this project to fruition and ensure it can become sustainable in the longer-term so any help you are able to give is much appreciated! Wow! What an amazing start to our week! We have had two pledges today of private donations which will enable us to continue and develop the work we’re doing in our local communities. £1,000 has been pledged from West London Security (WLS) and another £1,000 from Blaber Builders Ltd in Sheringham. These donations will really help us get out there and do what we do best – put a smile on people’s faces who are living with physical or mental conditions or disabilities while bringing real benefits to their health or wellbeing. Thank you! We are looking forward to our Christmas-themed session with The Friday Group on 16th December! This is a group for adults with disabilities that meet each week in North Walsham on Friday mornings in St Benets Hall. The attendees and their carers are all fabulous and we can’t wait to get back with them for more music-related shenanigans next month! We delivered a singing workshop for people with lung conditions yesterday in Sheringham. There is a good evidence-base of research highlighting the positive medical effects of singing for people with lung conditions and it was fantastic to be able to support people attending the Breathe Easy support group in Sheringham yesterday (linked to the British Lung Foundation). We had fun and we’re now shaping a project so that we can apply for funds to deliver more sessions in 2017 as they want us back! It was lovely to receive such positive feedback and see so many happy faces at the end of the session. Made a perfect end of the week for me, at least. We’ve also just made a grant application to carry out a joint project with some dementia cafes in North Norfolk so we’ll keep you posted on that too. We’re also hoping to help deliver some music workshops in North Norfolk for people living with dementia as part of the Creative Arts East programme ‘Our Day Out’. More information will be posted here as things develop. More news soon, thanks for reading and your interest in PFC! Hope to see you soon.